Molded EPDM rubber is ideal for outdoor applications because of its ability to resist harsh weather conditions. Also recommended for its ability to stabilize color and resist heat. 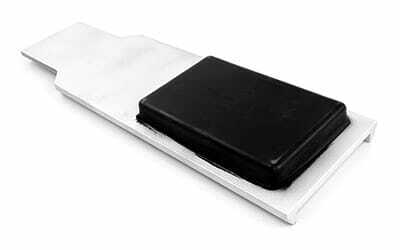 EPDM is an economical choice because it offers the advantages of neoprene, at a lower cost. EPDM is widely used in the automotive industry because it is ozone resistant, temperature resistant and has an attractive appearance. Utilizing injection molding and transfer molding to encapsulate and bond rubber to metal is the most effective way to adhere rubber to metal or plastic parts. The rubber to metal bonding process provides a superior mechanical bond of rubber to metal parts, inserts or plastic parts. The process requires a two-step preparation of the metal or plastic part prior to molding the rubber. First, the part must be degreased and cleaned of any contaminants, similar to preparation for industrial coatings or painting. Next, a special, heat-activated adhesive is uniformly sprayed onto the metal parts. Once the part is ready for rubber overmolding, the metal parts are inserted into the mold cavity. If molding a specific area, the metal part is held in place by special magnets. If the part is to be completely encapsulated with rubber, the part is held in place with chaplet pins. The mold is then closed and the rubber molding process begins. As the elevated molding temperature cures the rubber, it also activates the adhesive forming a mechanical bonding of rubber to metal or bonding rubber to plastic. To learn more about the rubber to metal bonding processes, click on the following link: rubber injection molding processor transfer molding process. When a metal or plastic part needs to be completely encapsulated with rubber, rubber insert molding, a variation of rubber to metal bonding, is used. For complete encapsulation, the plastic or metal part is suspended inside the bold cavity. Rubber can also be molded to a specific area of metal parts. Mechanically adhering rubber to metal can enhance the stability of metal parts with the flexible characteristics of rubber. Metal parts with molded rubber can improve part properties such as creating environmental seals, meeting NEMA standards, electrical conductivity, noise and vibration isolation, wear and impact resistance, chemical and corrosion resistance and more.